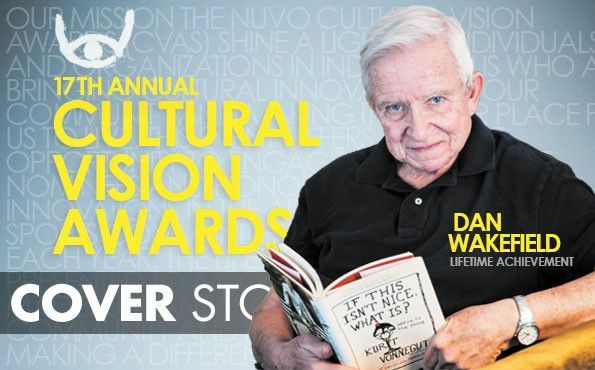 Dan Wakefield — journalist, novelist and screenwriter; raconteur, spiritual autobiographer and Vonnegut’s Oldest Living Friend (we borrow that epithet from the title of his blog) — has been thinking on the concept of “cultural vision” between bouts of packing and cleaning. He’s been back in his hometown for four years — after living for more than five decades on one coast or the other — and is already preparing to move into his third home here. The key appeal of his new place? It’s within walking distance of the Red Key, one of the two “touchstones for his cultural vision,” along with Indy Reads Books. It might not surprise you that a guy who puts such an emphasis on pragmatism and good work and authenticity isn’t quite sure he qualifies as an innovator or that he’s ready for a lifetime achievement award. But when you add up a lifetime of good work — with liberal helpings of fearlessness and iconoclasm — it’s not hard to make the argument on his behalf. And we can start from the beginning of his professional life. He continued to support himself by writing for magazines when he finally got back to the States,. working for GQ, Esquire, Harpers, The New York Times Magazine. And he published several non-fiction books, starting in 1959 with a survey of Spanish Harlem called Island in the City that was, history will record, favorably reviewed by the U.S. Ambassador to Guinea: “In a clearly written document, characterized by sympathetic understanding and authentic knowledge of the plight of Puerto Ricans seeking refuge from poverty, the former journalist, Dan Wakefield, discloses the rude fate that awaits those who must live in New York’s ‘Spanish Harlem.’ Another book, 1969’s Supernation at Peace and War, first reached readers in another form. The Atlantic sent him around the United States in 1968 to write about the impact of the war in Vietnam. His reporting took up the entire issue. Wakefield will allow that he was "a little bit ahead of the game" on that one. “I really had a great time writing it,” he says of what became Going All the Way. “I said, ‘I’m going to write a book about the way things really were. Not the way they were supposed to be. I was going to have people talk, not the way they were supposed to talk, but the way they really talked.’ It was a great feeling of freedom.” A good sign: Wakefield said that toward the end, he was laughing out loud at the scenes he was writing. And Wakefield didn’t make any public appearances locally for more than decade after the 1970 publication of the novel, which, to be fair, aims barbs at both Bible-thumpers and Bohemians. “There was such a hostile reaction to it here,” Wakefield says. “People said I was making fun of Indianapolis. I’ve often said that it could have set in Detroit or Cleveland or anywhere in the Midwest. But I don’t know anything about those places, and I do know about Indianapolis.” The only character based on a real person, according to Wakefield, was Gunner, who was modeled after his free-wheeling friend Ted Steeg, whom he memorialized in these pages last year. And then came a genuine health crisis: “Feeling myself going downhill and drinking more, I went to a doctor. I said, ‘I have this funny feeling my heart is beating too fast.’ He said, ‘You’re right. Your resting pulse is 120, which is twice what is normal.’” Wakefield headed back to Boston, checked into a cardiac rehab program, lost 20 pounds, got his resting pulse down to 60 — and started going to King’s Chapel, an 18th-century church on the Freedom Trail. His return to church led to a 1985 article in The New York Times Magazine — titled, straightforwardly, “Returning to Church” — which, in turn, led to a book with a similar title, Returning, and a new career as both a spiritual autobiographer and a person who teaches others how to write spiritual autobiography. Since the article and book “came out of a writing workshop at the church,” he figured he’d pass on what he’d learned, but swap out the word “spiritual” for “religious,” so that everyone could take part, regardless of denomination. He’s since led workshops at health spas and synagogues, think tanks and prisons (one of the best was at Sing-Sing). He did one during Lent at Northminster Presbyterian Church and the next is in Brown County in July (check his Facebook). That film led to another: A documentary adaptation of Wakefield’s 1992 memoir New York in the ‘50s directed by Betsy Blankenbaker. Attentive readers will have noticed Joan Didion popping up twice in this piece, and talk with Wakefield for a while and you’ll hear more names from his travels — Mia Farrow, Allen Ginsberg, Norman Mailer. (A 1992 New York Times feature on the book proclaimed that, at 60 years old, Wakefield had become “a Boswell of the heady days when art and literature had a singular flowering in the Village.”) Wakefield and Blankenbaker went to New York to interview the people he had written in about the memoir; the results aired on Showtime and are presently available on Netflix. What’s next for Wakefield? A new edition of his 1982 novel Under the Apple Tree is coming out in September from Hawthorn Publishing, with a new preface by Richard Lingeman, a former executive editor of The Nation born in Crawfordsville.